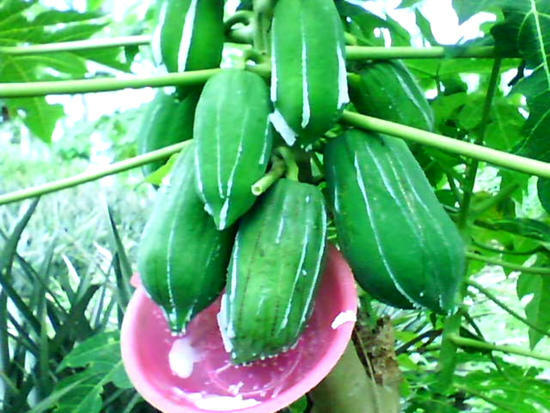 Papain is made from green papaya fruits while these are still attached to the tree. The bigger is the fruit, the more latex is derived. More amount of latex is gathered if this is done 3 times a week in a month. The more cuts are made, the less is the flow of latex. The best time for gathering latex is between 8:00 a.m. to 12:00 noon. 1. Cut the raw papaya (on the tree) with a sharp glass, about 2 mm. deep. 2. Collect the flowing latex in a plastic container and put in a glass bottle. 3. Dry the latex in the sun or oven. 4. Pulverize the dried latex.